At the first Congressional committee hearing in ten years to have the words climate change in the title, a Democrat and a Republican, perhaps surprisingly, stood side by side on the issue. “We can’t afford not to take urgent action,” North Carolina Democratic Gov. 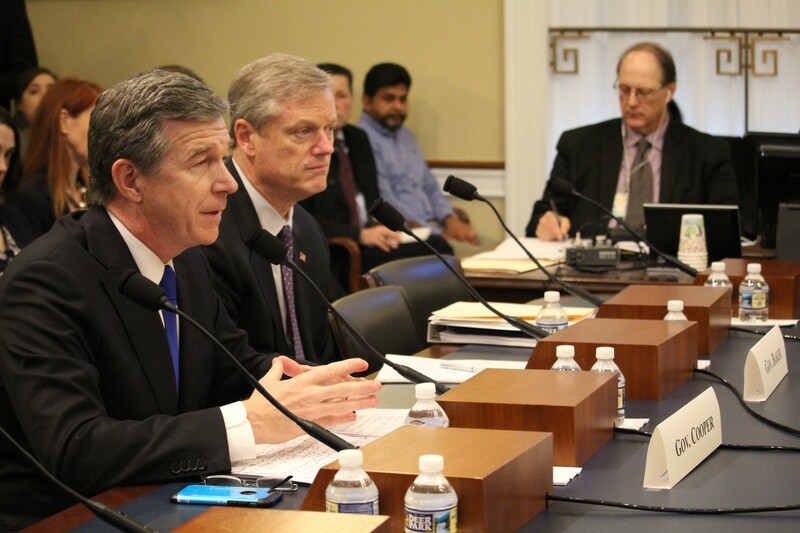 Roy Cooper told members of the House Natural Resources Committee this week in Washington. Sitting next to him before the committee was Charles Baker, the Republican governor of Massachusetts. Both testified to the effects climate change has had on their states, including industries, like agriculture and tourism, that have taken a hit. Changes in federal policy, that are accompanied by long-term commitments, have addressed and solved environmental problems for Massachusetts in the past, Baker said, pointing to the ending of acid rain caused by power plant, industry and vehicle emissions and the healing of the ozone layer thanks to an international treaty phasing out the use of harmful chemicals around the world. Those problems became manageable because of reasonable, long-term legislative fixes, Baker said. In North Carolina, Cooper is willing to forgo expansion in the fossil fuel industry through offshore drilling to protect what he called safer and more sustainable industries like commercial fishing and tourism that rely on healthy coastal environment. The testimony from the governors, however, was the only show of bipartisan agreement on the issue of climate change, even as the two continued to point to similar challenges faced by communities across their states. Chairman Raul Grijalva, a Democrat from Arizona, opened the hearing by highlighting the dangers and challenges of climate change that the general public is most likely familiar with, if not from personal experience, then through the media, like rising sea levels, disappearing coastal communities, draughts and superstorms. But instead of discussing climate change, the ranking Republican member of the committee, Rep. Rob Bishop of Utah, met Grijalva’s remarks with a jocular response, an attitude that persisted through the length of the meeting and was reflected in the banter of the roughly four GOP members of the committee who were also in attendance. The Republican members attempted to frame the conversation as public land management issues, in effect reducing the complex problem of a changing climate to one of government inefficiency and deflecting from the science of tracking climate change-induced natural disasters. California Republican Rep. Tom McClintock was among the most vocal supporters of the idea that privately-owned forests seem to be coping much better than the mismanaged public lands. Gov. Cooper pushed back at the idea, though, that pervasive wildfires could be prevented by simply managing federal lands better, saying that any action designed to increase the resiliency of habitats must be accompanied and balanced with proper environmental protections that reduce the strains on those habitats. 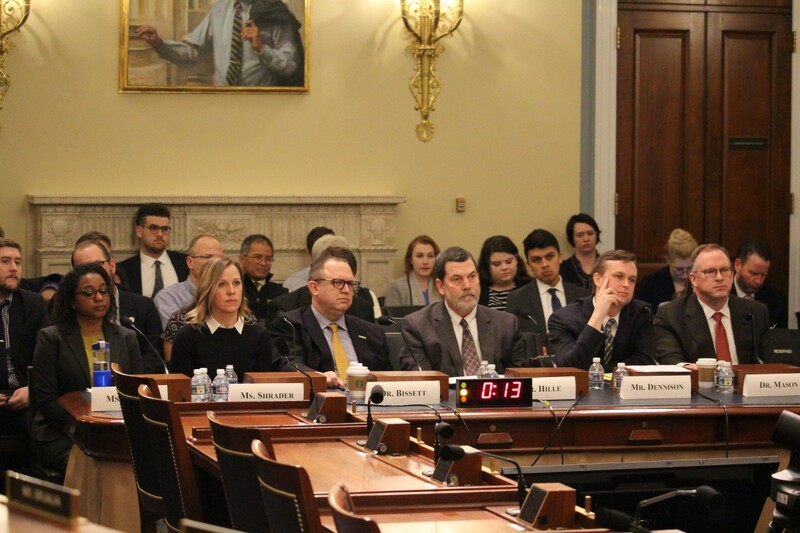 Witnesses at the hearing didn’t just testify for the protection of lands, but also of vulnerable populations that are on the frontlines of climate change, whether on the coasts of North Carolina and Massachusetts or in the coalfields of central Appalachia. Derrick Hollie, the president of the advocacy group Reaching America, said minorities suffer disproportionately from environmental injustice and are overburdened by high energy prices. Many black communities can’t afford cheap green solutions, because they have already suffered so many negative economic impacts, he said. The hearing happened on the eve of New York Democratic Congresswoman Alexandria Ocasio-Cortez and Massachusetts Democratic Senator Ed Markey’s Green New Deal framework, which proposes the most ambitious climate change agenda in American history. Released Thursday, it includes proposals to address the economic issues of historically underprivileged and oppressed populations, not just in fossil fuel dependent communities like central Appalachia, but across the country. So far, the framework lacks clearly defined policies that would make its ambitious goals feasible. Ocasio-Cortez, Markey and other lawmakers supporting the initiative succeeded, however, long before the release of their Green New Deal proposal inputting climate change back in the national headlines, potentially creating at least some of the momentum necessary for major policy change. The days have gotten shorter across Appalachia and the temperatures dropped which for many means the start of one thing — snow season. It means strapping on skis or hopping onto a sled to tear into soft, fluffy powder. That’s the case for Greg Corio, who for almost two decades has been an avid ice climber. Ice climbing is a fickle sport. Prolonged bouts of cool temperatures are required in order for ice to form into thick enough layers to support climbing. In temperate West Virginia, there has traditionally been just a small window of time where climbers can get out on the ice. Enthusiasts are ready to drop everything when the opportunity presents itself, Corio said. But in recent years, as temperatures have warmed, Corio said the window for ice climbing seems to be shrinking. He’s not the only one who is concerned. West Virginia’s ski industry, which generates an estimated $250 million in economic benefits annually, has long relied on snowmaking to help it keep reliable powder on the ground. But in the face of climate change, one resort is investing in new technology, in part to prepare for a warmer future. During a recent visit to Snowshoe Mountain Resort, nestled high on West Virginia’s second-tallest peak, the air is thick with falling snow and the tell-tale whir of snowmaking machines. Snowshoe aims to open Thanksgiving week, the first of the state’s five resorts to open each year. In its more than 40 years of operation, it has always relied on snowmaking to supplement mother nature. To replicate what nature does, Taymeyer’s snowmaking team takes highly-pressurized water and air and pipe it into a snow making machine, often called a snow gun. When the two elements collide, the water breaks into tiny particles. When they are blown into below freezing air they turn to snow. It’s a process he calls an “art” more than a science. 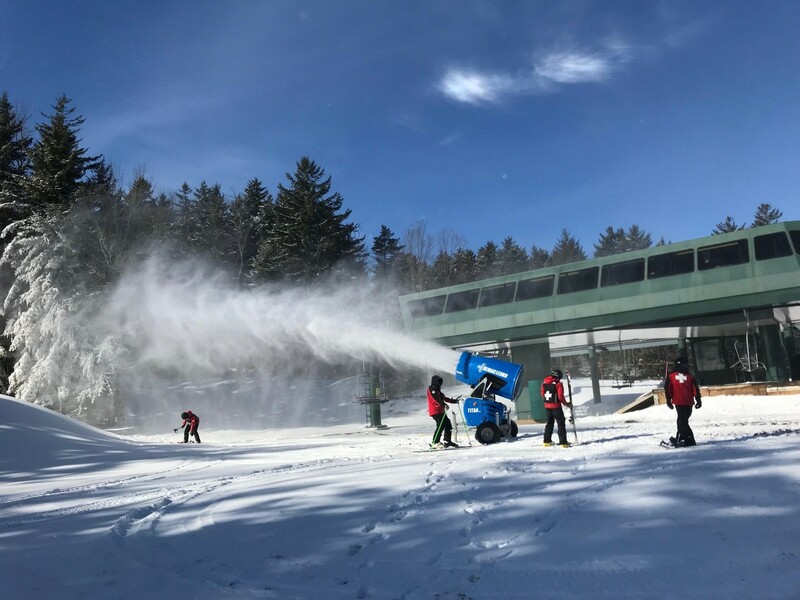 In recent years, warming temperatures, driven by climate change, is impacting the amount of time available for for snowmaking at Snowshoe, according to Shawn Cassell, the resort’s public relations manager. “The snowmaking windows that we see — the windows of time when the temperature is low enough to make snow — have gotten shorter over the years,” he said. To hedge against future warming and to reduce its own electricity use, Snowshoe has invested more than $4 million in newer, more efficient snowmaking machines. “We have to make as much snow as we used to, but in shorter buckets of time and the technology is keeping pace with that, and so continuing to invest in that technology is critical,” he said. Cassell takes me to see some of the new snowmaking machines. We head to Cupp Run, a long steep trail on the mountain’s western facing slope. The run is outfitted with 75 stick guns. Snow flies out of these 30-foot high metal poles, no thicker than a pipe you might find under your kitchen sink. They’re quiet enough that we can have a conversation standing right underneath them. “I think we’ve had these on since Monday afternoon and it was grass before that. So, it’s Thursday and there’s almost enough snow to open it,” Cassell said. Enough snow is an understatement. As we walk out on the run, we drop mid-thigh deep in icy powder. The stick guns use eight percent of the energy some of the older machines use. In total, the equipment upgrades at Snowshoe save an estimated 5 million kilowatt hours of electricity each year, or enough to power 500 homes. Some of the resort’s snow making machines have been automated to shut off when temperatures get too warm to make quality snow. The goal, Cassell said, is to be nimbler as snowmaking becomes an ever-increasingly important. But boosting climate resilience isn’t the top problem for everyone who works with West Virginia’s ski industry. Joe Stevens, executive director of the West Virginia Ski Areas Association, said the state’s variable topography has always meant West Virginia ski resorts have had to rely on snowmaking to provide that reliable product that skiers and snowboarders want. Over the years, one thing that has changed, Stevens said, is the amount of resorts offering summertime activities. Many resorts across West Virginia and the country, including Snowshoe, have also boosted summer offerings to include mountain biking, hiking, swimming, ziplining and more. While it makes financial sense to diversify, the move also serves as another hedge against climate change, especially warming temperatures. Data from the last 50 years shows West Virginia is warmer than it once was, said Jake Crouch, a climate scientist at the National Oceanic and Atmospheric Administration’s National Centers for Environmental Information. Compared to much of the rest of the United States, temperatures in West Virginia have not risen as much, but that is expected to change. Already, the data show temperature variability has changed. “One thing we are seeing is that the really warm years are getting warmer and the really cold years are also getting warmer,” Crouch said. Nicolas Zegre, associate professor of forest hydrology and director of the Mountain Hydrology Lab at West Virginia University, said in many ways how the Mountain State is experiencing climate change is unique, driven largely because West Virginia is impacted by weather patterns from multiple surrounding regions, including the Gulf of Mexico, the Great Lakes and the Atlantic Ocean. “The different weather systems combined with the complex topography means that we have a lot of variability in precipitation and streamflow and forest type and so on and so forth,” he said. And because West Virginia receives precipitation year-round, predicting how climate change will manifest in West Virginia gets tricky. “The really the important thing is the system as we know it is changing because it’s becoming more variable,” he said. Back at Snowshoe, Cassell said the increasing variability due to climate change is an important reason the company is investing in new, more efficient snowmaking equipment.